Brookfield, Vt., residents fear that Postal Service changes will eventually lead to the closing of their small town post office. About 1,300 people live in Brookfield, according to 2010 U.S. Census figures. In rural Vermont, the U.S. Postal Service decision to discontinue Saturday letter delivery is yet another blow to an institution that's long been a fixture of village life. Last year, the U.S. Postal Service abandoned plans to close thousands of small post offices, opting instead to cut hours. But there are fears the cuts will continue until the rural post office is no more. Two highways lead to the village of Brookfield, Vt., but the pavement ends where the village begins. For years, Brookfield residents have famously resisted any plan to improve the bumpy dirt road that serves as their main drag. But they recognize that the rest of the world is changing. It's been a long time since cartoonist Ed Koren used the mail for work. There are now faster ways for him to get his drawings from Brookfield to his editors at The New Yorker magazine. But Koren still uses the village's tiny post office for personal correspondence. 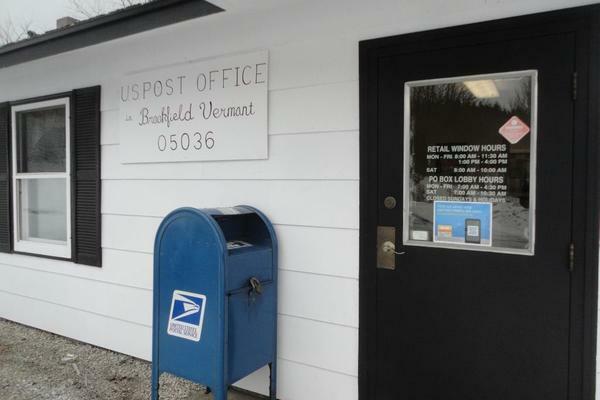 Brookfield is one of more than 140 Vermont post offices facing cuts in retail hours. Some will operate as few as two hours daily. Koren suspects that one day there won't be a local rural post office. "If they curtail services, fewer people will come. Fewer people will use it and then the justification for getting rid of it altogether," he says. Even without a post office, rural customers get their mail delivered, and online services make it possible to send packages from home. But there's no general store in Brookfield, so the post office is part of the village's social life. At an impromptu gathering there this week the consensus was that losing Saturday letter delivery isn't so bad. Restaurant owner Lee Duberman says what hurts is the cumulative effect of ongoing reductions in hours and services. "They've been cutting and cutting and cutting so I assume they're going to continue to cut. And, us, out here, we're feeling more and more cut off, I think," she says. Like many people, Duberman uses the mail less than in the past. She pays bills and does a lot of her restaurant's business online. That's not so easy for Vermonters still out of reach of broadband service or those like Bonnie Fallon who is concerned about online privacy. "I am an old dinosaur and will not pay any bills online. You know, and I'm going to be left behind," she says. "I know that." The village of Randolph Center is about eight miles from Brookfield. Most weekday mornings customers settle into rocking chairs at the back of Floyd's General Store to drink coffee and solve the world's problems. The feeling here is that the cuts are necessary even if they lead to closing the post office. That's business, says Perry Armstrong. "I think that change is here. If they gotta close it, they gotta close it," he says. Later this month the postal service will reduce retail hours at the Randolph Center post office. People often drop their packages at the general store for owner Al Floyd to walk over to the post office when it's open. Floyd thinks eventually the postal service will shut it down entirely. "I think they will but they're going to take the heart right out of the town," he says. "It gives it a name. I mean, we got a ZIP code!" As Floyd sees it, the presence of a post office is part of what makes a village a village. In rural Vermont, the postal service decision to discontinue Saturday letter delivery is another blow to an institution that's long been a fixture of village life. Last year, the postal service abandoned plans to close thousands of small post offices - opting instead to cut hours - but as Steve Zind of Vermont Public Radio reports, there are fears that cuts will continue until the rural post office is no more. STEVE ZIND, BYLINE: Two highways lead to the village of Brookfield, Vermont, but the pavement ends where the village begins. For years, Brookfield residents have famously resisted any plan to improve the bumpy dirt road that serves as their main drag. But they recognize that the rest of the world is changing. It's been a long time since cartoonist Ed Koren used the mail for work. UNIDENTIFIED MAN: OK, that's going to be 66 cents. ZIND: There are now faster ways for him to get his drawings from Brookfield to his editors at the New Yorker magazine, but Koren still uses the village's tiny post office for personal correspondence. Brookfield is one of more than 140 Vermont post offices facing cuts in retail hours. Some will operate as few as two hours daily. Koren suspects that one day there won't be a local rural post office. KOREN: As they curtail services, the fewer people will come, fewer people will use it and then justification for getting rid of it all together. ZIND: Even without a post office, rural customers get their mail delivered and online services make it possible to send packages from home. But there's no general store in Brookfield, so the post office is part of the village's social life. UNIDENTIFIED WOMAN #1: Good to see you. I was just talking about you two with Ariels(ph). ZIND: At a impromptu gathering this week, the consensus was losing Saturday letter delivery isn't so bad. Local restaurant owner Lee Duberman says what hurts is the cumulative effect of ongoing reductions in hours and services. LEE DUBERMAN: They've been cutting and cutting and cutting, so I assume they're going to continue to cut. And us out there, we're feeling more and more cut off, I think. ZIND: Like many people, Duberman uses the mail less than in the past. She pays bills and does a lot of her restaurant's business online. That's not so easy for Vermonters still out of reach of broadband service, or those like Bonnie Fallon who's concerned about online privacy. BONNIE FALLON: I am an old dinosaur and will not pay any bills online. You know, and I'm going to be left behind. I know that. ZIND: The village of Randolph Center is about eight miles from Brookfield. Most weekday mornings customers settle into rocking chairs at the back of Floyd's General Store to drink coffee and solve the world's problems. UNIDENTIFIED WOMAN #2: Grab a seat. ZIND: The feeling here is that the cuts are necessary, even if they lead to closing the post office. That's business, says Perry Armstrong. PERRY ARMSTRONG: I think that change is here. If they've got to close it, they're going to close it. ZIND: Later this month, the postal service will reduce retail hours at the Randolph Center Post Office. People often drop their packages at the general store for owner Al Floyd to walk over to the post office when it is open. Floyd thinks eventually the postal service will shut it down entirely. AL FLOYD: I think they will, but they're going to take the heart right out of the town, because of the name. I mean, we've got a zip code. ZIND: As Floyd see is, the presence of a post office is part of what makes a village a village. For NPR News, I'm Steve Zind. Transcript provided by NPR, Copyright NPR.